For too long, corporate messaging has been driven by tactics and vehicles (e.g., creating new advertising copy; updating the content on the company website; developing new sales presentations; etc.). This fragmented, ad hoc approach to corporate messaging is fundamentally flawed. It causes a significant breakdown in customer communication. It also creates confusion in the minds of customers with respect to a company’s brand promise, challenges the company’s services and products address, competitive differentiation and the value a company delivers to customers. With many organizations following this haphazard approach, it’s no wonder the CMO Council found that less than 25 percent of marketing executives believe they are effectively managing sales and marketing messages, and just 27 percent of CMOs are confident their teams are on message. Formulating a clear, compelling and consistent corporate message doesn’t happen by chance. Rather, it must be strategically designed and managed with great discipline. To design a clear, compelling and consistent corporate message, the company’s story must align with its go-to-market strategy as well as the vision, mission and values of the organization. While this may have been clear in the early stages of the business, a lot can change over time: new products and services are developed, new leadership is put into place and business models change. Therefore, it is critical that the leadership team discuss the current — and future — state of the business and the impact these plans have on corporate messaging and positioning. With a clear understanding of the state of the business and its strategic direction, it is now possible to assess how that strategy aligns with customer requirements, aspirations and perceptions. To make this happen, an intentional process for gathering critical insights from internal and external customers is necessary. These employee and customer interviews glean important insights about the brand, challenges the company’s services and products address, competitive differentiation and the value it delivers to customers. The interviews also help answer critical questions such as: How does the organization create value? How is the company different or better than other companies in the market? What are the current strengths and weaknesses? What personal and professional goals can the company help customers achieve? The next critical step is to understand the story competitors are telling in the market. This requires a top-to-bottom assessment of the messaging they deliver through customer-facing communication vehicles including the messaging contained within competitor websites, thought leadership content, sales materials, social media channels and more. The goal is to answer questions such as: What promise is the competition making to customers? What position are they trying to own in the market? What are the core benefits of the products / services they offer? How are they communicating their unique points of difference? What value do they say they are delivering to customers? The knowledge gained during these three critical steps is then used to design a Corporate Messaging Architecture. These elements, clearly defined and documented, establish the building blocks of a corporate story. They are the statements and words every employee within the company must use to ensure the corporate message remains clear, compelling and consistent across all communication channels. The Corporate Messaging Architecture is used to develop and package repeatable messaging content that drives consistent communication throughout the customer experience. This content includes 50-, 250- and 500-word descriptions of the company, a consistent corporate elevator pitch, messages used to describe the company in corporate and employee social media profiles and so much more. 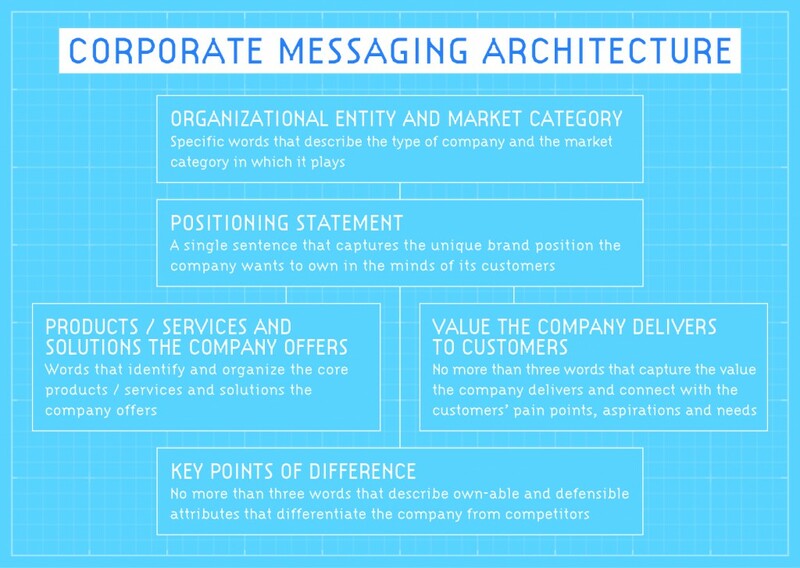 The Corporate Messaging Architecture is the foundation from which a clear, compelling and consistent message is delivered in the marketplace. But that’s just the beginning. Employees must be able to articulate this story in the conversations and connections they have with customers everyday. This doesn’t happen by chance. A recent Gallup Poll found that only 41 percent of managers and 9 percent of front line workers know what their companies stand for and what makes their companies different from the competition. These statistics illustrate that, while a well-designed Corporate Messaging Architecture is critical, there is still work to be done. For the corporate message to be delivered in a clear and consistent manner, it must be infused into the company and culture. This means implementing a disciplined and sustained organizational change initiative that arms employees with the training, education and knowledge necessary to activate the Corporate Messaging Architecture in the customer experience. Just how important is it to strategically design corporate messaging? According to Harvard Business Review, companies that deliver a consistent message throughout the customer journey increase revenue 10–15 percent and reduce costs 15–20 percent. So, to reap the benefits of delivering a clear, compelling and consistent corporate message, it is important to remember it won’t happen by chance — only by design. More specifically, through a disciplined design process that includes a clearly defined and documented Corporate Messaging Architecture combined with the training and education programs employees need to bring the story to life. Your Company Needs a CCO How I . . .
Great article about designing a corporate message, James. Remember, though, that there’s a difference between a corporate message and a corporate story — a corporate story needs to be flexible enough to engage audiences in the conversation, so it creates true alignment and motivation.